An edible landscape can include much more than fruit trees and vegetables. The Southern Appalachian woods contain a plethora of edible and medicinal plants, which can be found at a few small local nurseries. By incorporating these plants, we're eventually lessening our workload in growing our own food. The perennial herbs come back year after year and typically don't need to be replanted. And, since these natives are accustomed to growing in the local ecosystem, they typically survive disease and pest pressure as long as they have the proper nutrients, pH level and sun exposure. 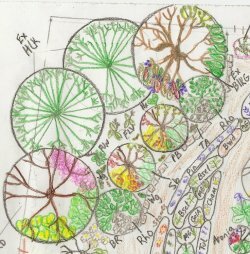 I'm showcasing this landscape design (pictured above) because it contains many Appalachian edibles as well as other elements I like to include in my designs. The layout of the yard, the existing vegetation and the solar exposure all combine to create the perfect setting to establish several different ecosystems, even though the front yard is less than a quarter of an acre. By using primarily perennial and/or native plants, we are limiting the amount of labor required to maintain the property once all the vegetation has filled in the space. We're also including many plants with qualities that benefit other plants, helping to create a self-maintaining landscape. Tamara (the main gardener in the family) and her husband Jeff both have full-time jobs and a young daughter. Tamara enjoys gardening, but most of that time is reserved for attending vegetable beds in their backyard. So whatever she plants in the front yard should be relatively low maintenance in the long-term. 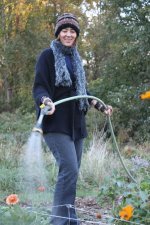 Her goals are to better control weeds in existing ornamental beds, incorporate native plants, and make use of the full sun in the middle of the yard by adding semi-dwarf fruit trees. To my delight, Tamara is especially interested in using medicinal herbs, a long-time interest of mine. 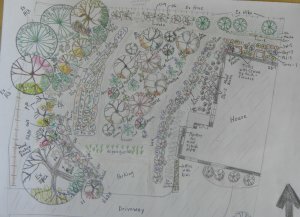 She envisions the finished landscape having a "cottage-style" feel. "We've struggled for a long time over what to do with our front yard," Tamara said. "When I contacted Megan to do a landscaping plan, I was so excited that she really listened to what our goals for the yard were. 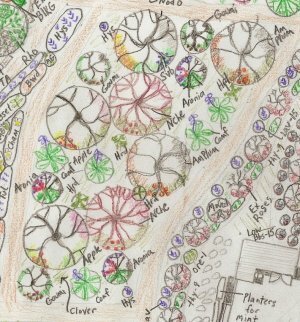 Megan really took a lot of care to research what would work best for our yard and added tons of flowers and plants I'd never even thought of. She also provided lots of additional information on the benefits and uses of each plant she was recommending. She was so thorough and creative." The first tree to greet us to the property is an existing black cherry tree. 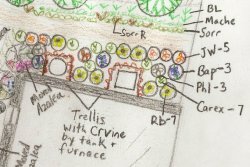 Around it, we will create a "Rich Cove" ecosystem, incorporating a shrub border and groundcover with shade-loving medicinal herbs, first adding organic matter to increase the fertility. The shrub border has a mixture of three different native shrubs, including Viburnum. Out of the many varieties of Viburnum, I suggest the native blackhaw, not only for its showy creamy white flat-top flowers and edible blue drupe that can be used in jams, but also for its medicinal values. The bark from the branches can be used as a relaxant and sedative, particularly for disorders of the female reproductive organs. Among the five different herbs in the groundcover is Solomon's Seal, a versatile medicinal herb most well known for treating injuries of the musculoskeletal system. I encourage the cultivation of herbs that can be hard to find in natural foods stores such as Solomon's Seal to help prevent their overharvest from their natural habitat. In the adjacent corner of the property, where hemlocks, a black gum and redbud currently live, we'll create a "Heath Mix" ecosystem, adding pine bark mulch to boost the acidity of the soil and installing understory trees such as rhododendron and spicebush. The groundcover will be a mix of low-growing edible and medicinal native evergreens such as wintergreen. It has edible red berries and medicinal leaves, traditionally used for colds, headaches, stomachaches and kidney ailments. Wintergreen also contains a volatile (potentially airborne) organic compound called methyl salicylate, which enhances plant communication. The chemical switches on neighboring plants' genes that protect them from disease-causing microbes. Abelias currently live along a privacy fence on the north border of the property. We will fill in this area with green-and-golds and other native groundcovers to crowd out weeds. The back corner of the property will feature a pocket of medium to tall natives, all good for inviting pollinators and butterflies. Among them is one of Tamara's herb interests, jewelweed, which has a delicate orange pendent-like flower shaped like a trumpet that attracts hummingbirds. The juices from the stalk and leaves also alleviate the first signs of a poison ivy rash. Crossvine, a native begonia, will be trellised to screen a propane tank and furnace. Since this area has been taken over by weeds in the past, we're currently solarizing it with a plastic tarp, which we will remove after a few months and then build up the soil with layers of weed-suppressing cardboard and organic matter. 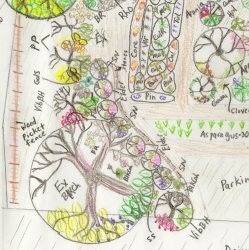 The center of the yard will be the orchard, which is designed to be a forest garden with upper-, mid- and understory levels, incorporating plants that are beneficial to the fruit trees, all semi-dwarf. Among the beneficial plants is comfrey, which has a long taproot that pulls up nutrients from far below the surface. The large fuzzy dark green leaves can be harvested and spread along the orchard ground to increase nutrients for the fruit trees. Horseradish will also be planted near the trees since its roots are said to prevent rots on apples, cherries and plums. The shrub layer includes the edible goumi, which fixes nitrogen in the soil so that it is in a usable form for surrounding plants. Next to the orchard will be a prairie-like ecosystem, a bed of perennial flowers and self-seeding annuals mainly planted to attract beneficial insects that are predators of common orchard pests. I combine an array of flower colors that are complementary to the rest of the landscape as well as vary the types of inflorescenses, or flower structures, incorporating several plant families such as the aster, carrot and figwort families. By doing so, the hope is to accommodate an array of beneficial insects with all sorts of mouthparts needed to extract the nectar from the flowers. The diversity of flowers also adds to the visual appeal of the garden. None of the plants in the bed aggressively self-seed or spread rhizomes (underground stems), limiting the work needed to keep the plants in check. $20 — Initial Intake: An in-depth interview and walk around the property to gauge the client's needs, wishes and vision. Some quick advice and gardening tidbits are included in the discussion, which typically takes about an hour. $50 — Initial Recommendations: Following an in-depth interview with the client, I write detailed recommendations addressing the client's most pressing issues, along with a proposed timeline and estimated budget for the landscape work. $100 — A Day in the Garden: I provide instruction at the client's garden on one or more of the following topics: setting up no-till gardens; prepping beds and planting; managing pests; pruning and trellising; building season extension structures; and preparing the garden for the winter. Sessions typically last two to four hours. Package includes educational materials to help the client prepare for the visit and follow up with the work. 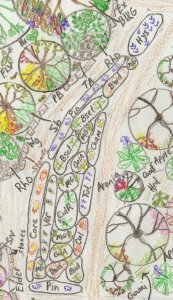 $Your Choice — Edible, Medicinal and Native Landscape Design: Fees vary widely depending on needs of the client and size of the property. For the gift certificate, you may contribute what you are able to, helping fund a larger project. This statement may seem strange to those who are used to waiting to even think about their gardens until the first sunny warm days of March. But no-till gardening, a low maintenance method that produces high quality vegetables in a sustainable way, requires some thinking ahead. If we layer cardboard, leaves and other organic matter on top of grass now, we'll have a fertile bed for our plants in the spring. Wishing you and yours a wonderful, safe and healthy holiday season!